This year’s PGA TOUR Champions players are in for a thrill and a challenge when they tee off at the classically designed, Scottish-style Donald Ross golf course at Exmoor Country Club on July 12. Many of the best senior players on the circuit will participate in what promises to be a spectator-rich and exciting four-day event culminating on the scenic 18th hole at Exmoor in Highland Park. “Exmoor’s golf course has a historic pedigree that exemplifies the Golden Age of golf architecture,” says Don Holton, official club historian and member for 31 years. Established in 1896, Exmoor is the third oldest golf course in Illinois, one of the 11 charter clubs that established the Western Golf Association (WGA) in 1899, and one of just seven WGA founding clubs remaining. The course was originally designed as a 9-hole course by golf course architects with first-hand experience in Scotland: Charles B. Macdonald, Herbert J. Tweedie, and H. J. Whigham. In 1908, Scotsman Stewart Gardner designed the 18-hole layout at Exmoor. Then, in 1915, the club commissioned architect Donald J. Ross, a native of Scotland and considered the “dean” of golf course architecture, to redesign the course to resemble a classic Scottish-style course with natural grasses and open vistas, and elevate it to a new level of championship quality. The quality of the course is one of the many reasons the PGA TOUR Champions selected Exmoor for the upcoming Constellation championship, one of the five Major tournaments on the TOUR Champions. 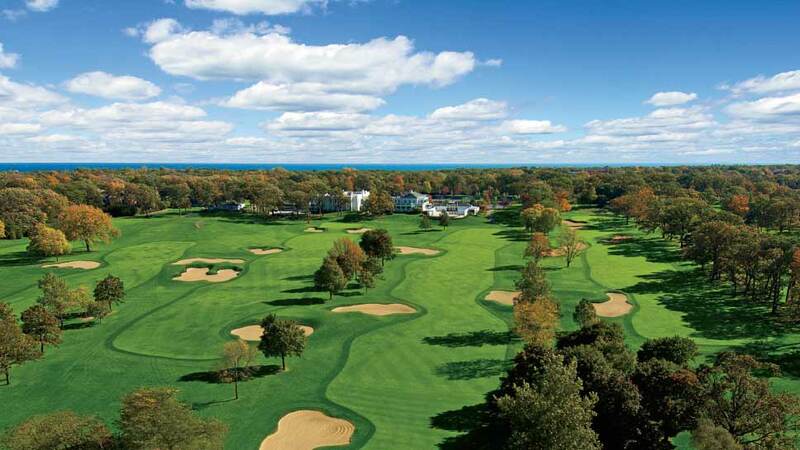 The tournament has visited some of the best venues on the East Coast, with stops at Baltimore Country Club, Westchester Country Club, Fox Chapel Golf Club, and Philadelphia Cricket Club’s famed Wissahickon Course. The 2018 event will be managed by the WGA in partnership with the PGA TOUR’s Championship Management division. Being selected by the PGA TOUR Champions to host a major championship is one thing, but accepting the invitation is another. It was no small decision for the Exmoor board to agree to undertake an event of this magnitude. While it will be the 18th national championship for both women’s and men’s golf hosted at the club, all previous tournaments held at Exmoor promoted amateur golf with top players from all over the world. This is the very first professional tournament Exmoor has ever hosted. “We were delighted to be selected and proud to be part of an exciting local sporting event benefitting local charities,” says Stevenson. “This is a major event on the PGA TOUR that is organized and run by the WGA.” A tournament of this stature and magnitude will require upwards of 1,000 volunteers to make the tournament a success. Many of these volunteers will come from the ranks of Exmoor members with additional opportunities available to others interested in participating. Most of the PGA TOUR Champions playing at Exmoor in July are familiar names to area golfers. One local player is former PGA Champion, Jeff Sluman, formerly of Hinsdale and now a resident of Florida and Chicago. Defending champion of the 2017 Constellation SENIOR PLAYERS Championship, Scott McCarron, counts six other PGA TOUR victories to his name. He’ll be up against some tough competition with Bernhard Langer, three-time Constellation SENIOR PLAYERS champion from 2014 to 2016. Other notable players confirmed include Jay Haas, John Daly, Kenny Perry, Colin Montgomerie, Sandy Lyle, Jerry Kelly, Kevin Sutherland, David Toms, and Joe Durant. Constellation Energy, the tournament’s primary sponsor, will donate $500,000 to local charities. One such charity is the Evans Scholar Foundation, founded by golf great Chick Evans, winner of eight Western Amateur championships and the U.S. Open, and member of Exmoor dating back to 1909. The fund has been providing scholarships to caddies with limited access to college since 1930. Exmoor Country Club is located at 700 Vine Avenue in Highland Park. For more information and tickets, visit cspgolf.com.